Arabella is the charter version and features four cabins. There is also an additional single berth forward and the salon table converts to a double bunk. Each of the four ensuite bathrooms have electric heads. There is also onboard air conditioning provided by a generator. There is a great flybridge helm position with a fixed bimini, plus a good size cockpit so lots of outdoor space. 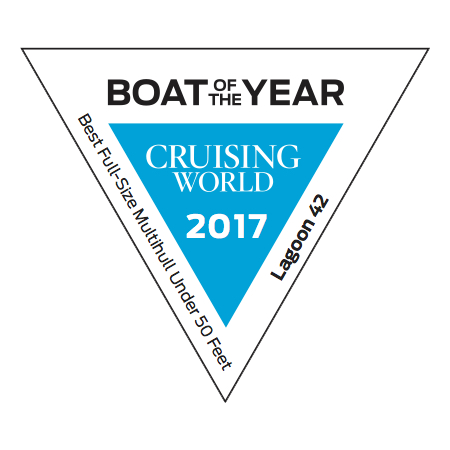 The Lagoon 42 has also been awarded Cruising World Boat of the Year - Best full size multihull under 50 feet in 2017. Check out the full Cruising World article here: Lagoon 42 Boat of the Year.